About a year and a half ago, when Emmalee was in sixth grade, the normally bubbly girl was feeling anything but. She started looking pale and felt so tired that she wanted to go straight to bed after school. 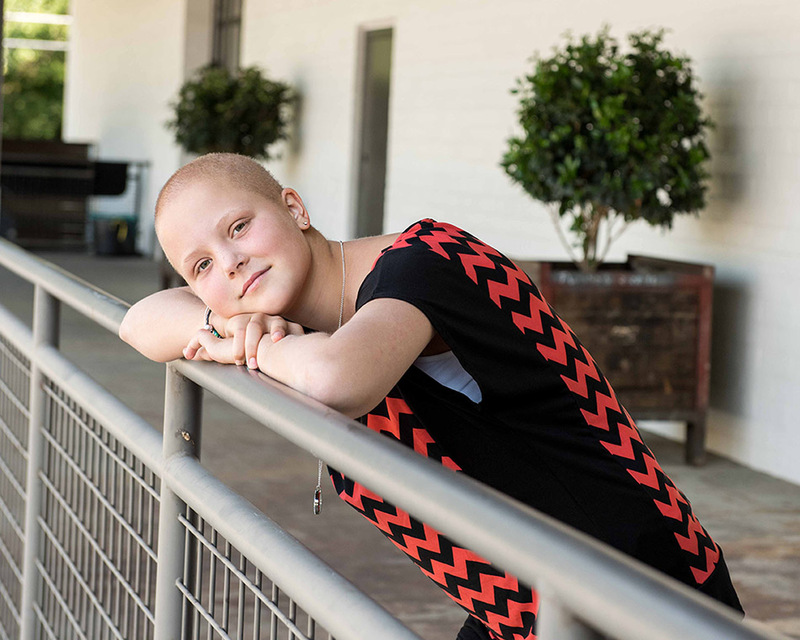 It only took one blood draw to diagnosis the problem: leukemia. Within a month, her hair was gone…along with the life she used to know. What followed was chemotherapy every week for a year, spending many long nights in the hospital. What Emmalee really needed was some fun! Enter Team Summer kid Gabriella! 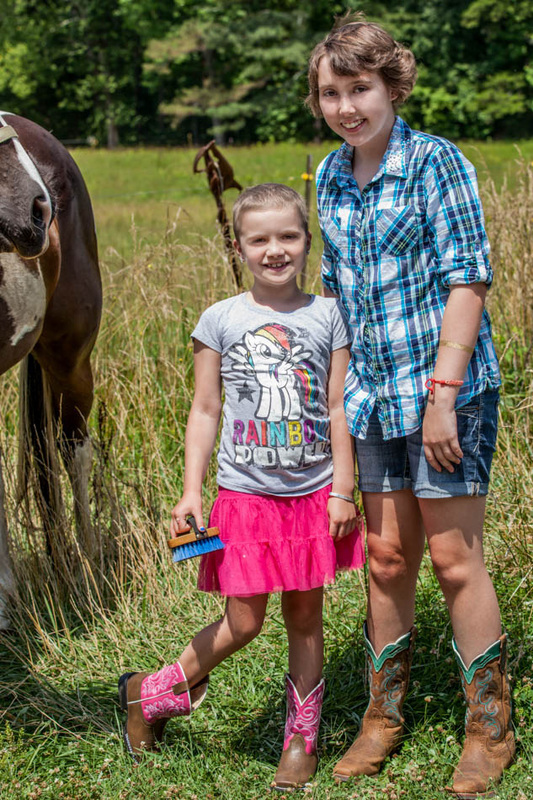 Last year, when she was eight years old and locked in her own battle with leukemia, Team Summer kid Kayla came along and gave her something to smile about – horseback riding lessons and perfect pink riding boots! 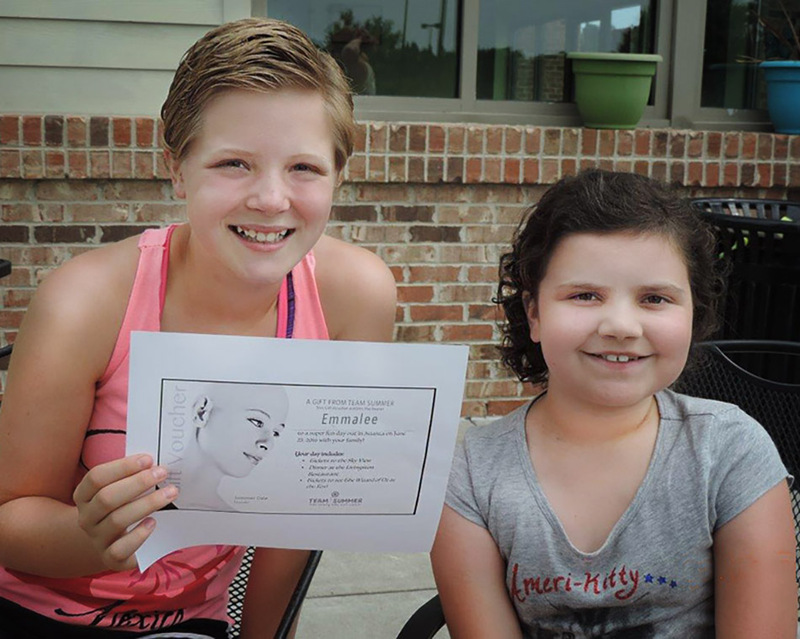 Gabriella met Emmalee when they had rooms down the hall from each other in the hospital, and wanted to pay it forward by getting Emmalee a Team Summer gift. We found out that Emmalee had a big interest in acting and theatre. And it turns out she had never been to Atlanta before. So we put it all together and planned Emmalee’s big day out! A couple of weeks ahead of time, Gabriella surprised her with the news! Finally, it was time for Emmalee’s big day out! 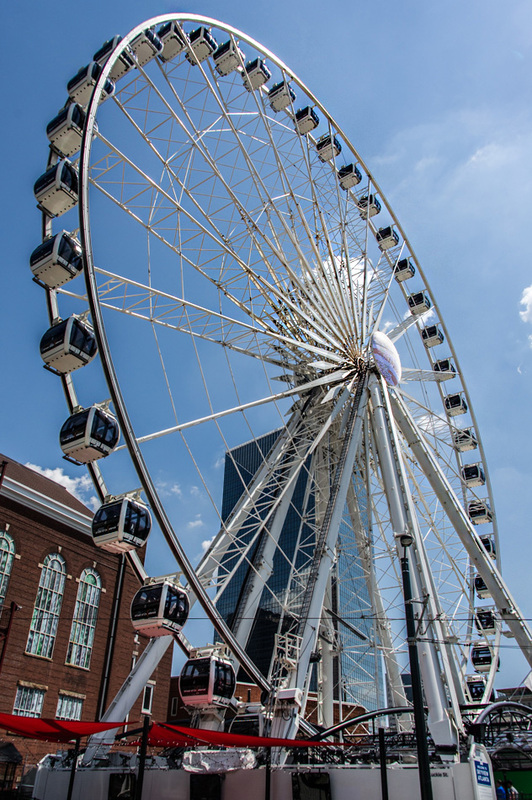 She started at the top – the top of Atlanta’s giant Ferris wheel, that is! 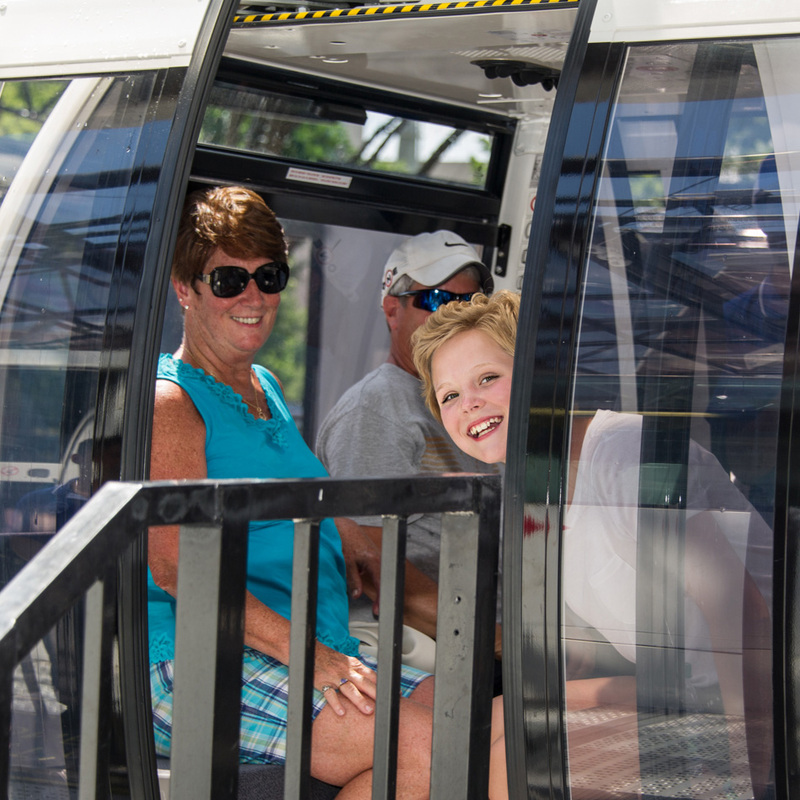 Located in Centennial Olympic Park, it’s a full 200 feet tall and features luxurious, climate-controlled gondolas. Without missing a beat, Emmalee, her sister, and some family friends who joined them, piled in. 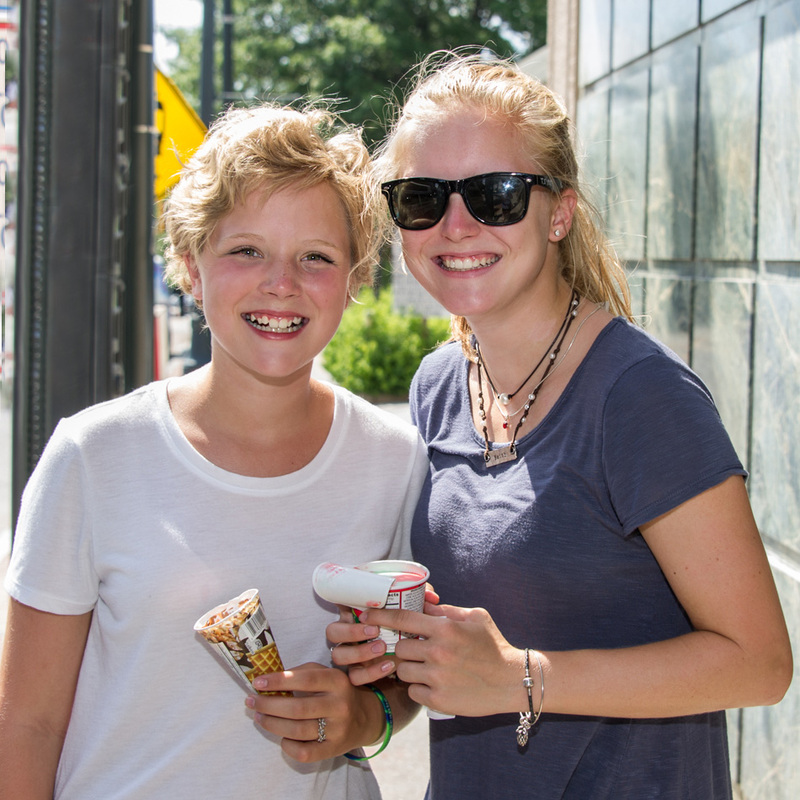 Turns out the air-conditioning in the gondolas was not working all that well – it was 98 degrees that day, after all – so next we got them a little ice cream to cool down! Then it was time for a surprise we didn’t plan. 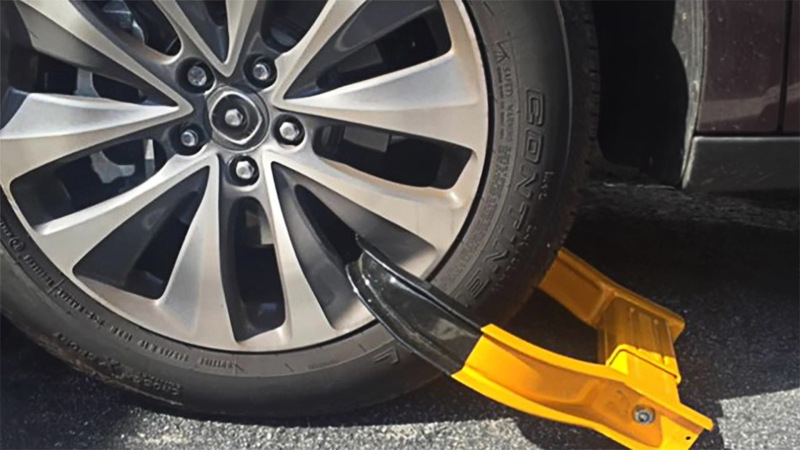 When Emmalee and her family got back to their cars, they discovered that they had been booted! The time on the meter had just run out. Welcome to the big city, Emmalee! But if you have lived through a year of cancer treatments, not much fazes you. With the help of the Team Summer volunteers, the boots came off, and the adventure continued! 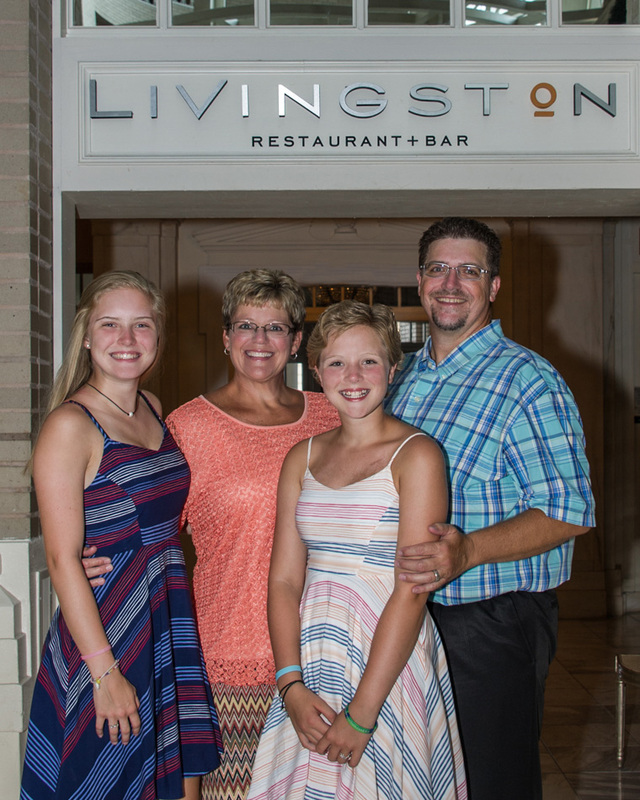 Next up, a wardrobe change and dinner at the elegant Livingston restaurant! This was a special time for the whole family to be together, something hard to pull off when you have a child battling cancer. Does this girl look happy or what?? But the best part of Emmalee’s big day out was yet to come! 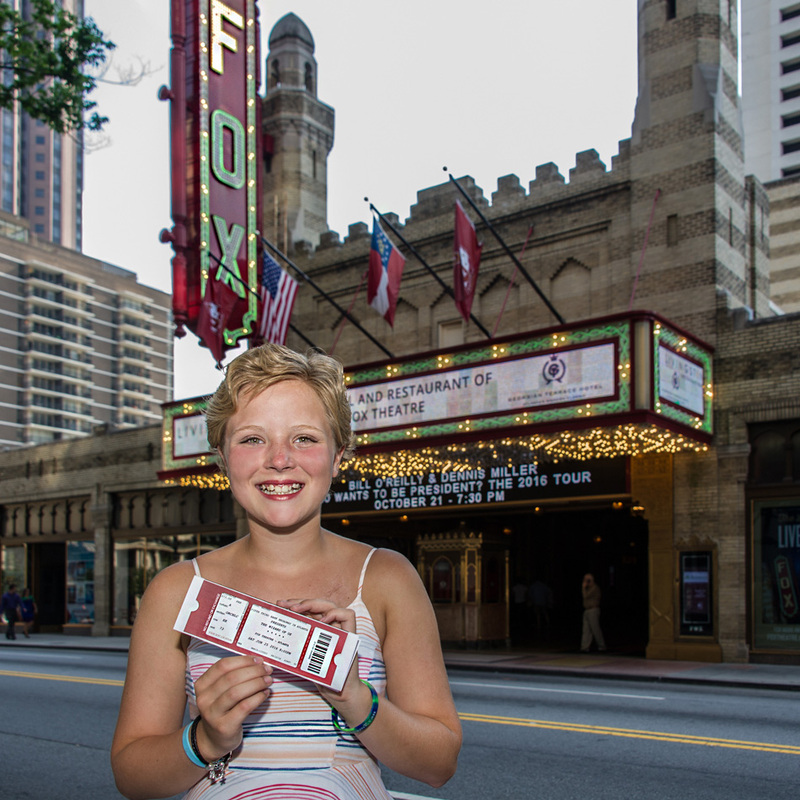 Thanks to our amazing donors, we were able to get Emmalee and her family tickets to the musical The Wizard of Oz at the historic Fox Theatre!!! 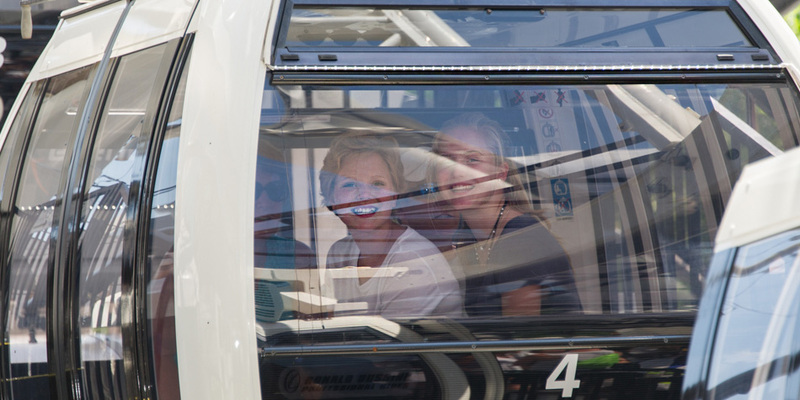 Just when you thought that smile could not get any bigger! By all reports, they had the MOST amazing time! And a couple of weeks later, we found this adorable thank-you note from Emmalee in our Team Summer mailbox! Thank you so much for taking the time to write to us, Emmalee! We passed your note all around! And thanks to everyone who helped make this day so special for Emmalee! 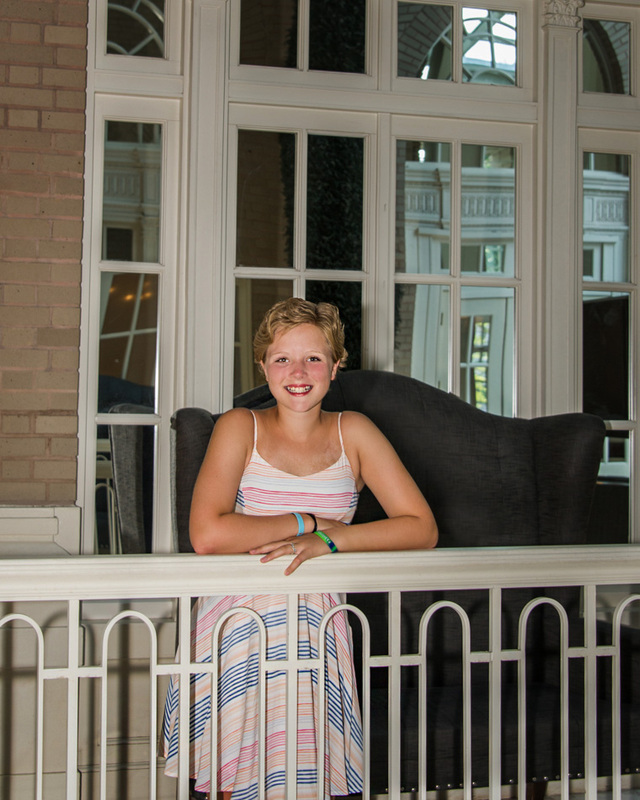 And most of all, thanks to Gabriella who looked beyond her own troubles to help another kid with cancer. Way to go Gabriella! You are just what Team Summer is all about!